Case (5 pouches) $279.95 FREE SHIPPING! Multi-Pack. Choose multiple flavors for 2 or more pouches. Mention choices in comments. 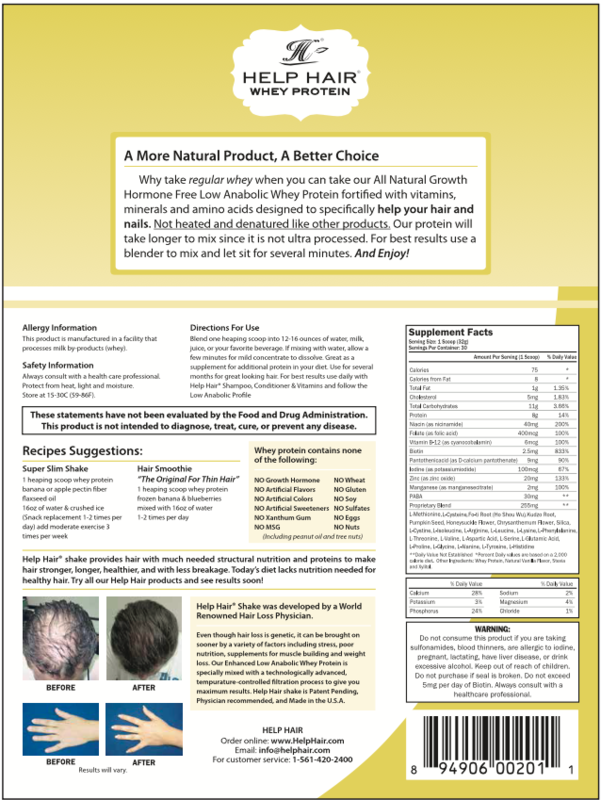 Help Hair® Shake is a whey protein shake for hair loss using Natural ingredients. Help Hair Shake has protein for hair with added important vitamins including Niacin, B-12 and Biotin dosed properly which are the best hair vitamins. The Whey Protein Shake for hair loss nourishes the hair follicles with all the nutrients for rapid hair growth. Use Help Hair Shake daily with our Help Hair Vitamins for longer, healthier hair. The Help Hair® Shake combines whey protein for hair and enhanced with vitamins containing essential minerals such as magnesium and zinc. Feeding your hair amino acids from protein daily our Help Hair Shake will give you full, healthy hair! Help Hair Shake® taken daily with Help Hair® Vitamins will make your hair feel thicker, fuller, healthier, and diminish shedding. Use Help Hair Shake daily with our 4 Step Treatment program. Help Hair Shake, Help Hair Vitamins, Help Hair Shampoo and Help Hair Conditioner. The Help Hair® Shake features a Low Anabolic protein for hair growth and fortified with vitamins containing important minerals blended in a proper ratio for maximum growth. The hair is 97% protein. Feed your hair protein daily with amino acids in Help Hair Shake. Vitamins alone will not support the hair if you are deficient in protein. Help Hair Shake® supports healthy hair by giving the hair shaft and root with the nutrients for maximum growth. Help Hair® whey protein shake is a vitamin rich protein shake for hair growth suitable as an for muscle development and weight loss programs, providing nutrients lacking in today's diets. Help Hair Shake provides structural nutrition with essential amino acids, proteins, vitamins and minerals. Help Hair® shake provides all the vitamins and protein that make up the nutrition support for hair loss from menopause, post pregnancy, from stress and anesthesia from surgery. Start our program today to ensure the best possible results. Our proprietary formula is the only all natural, growth hormone free low anabolic whey protein providing hair loss vitamins to make your hair look thicker and fuller. Unlike whey protein isolate which our studies have shown to accelerate hair loss found in most weight loss and workout products. It is an excellent daily supplement when when your life is stressed and you start shedding 100-150 hairs a day or to replace weight training products or dieting programs. Help Hair® Shake and Help Hair® Vitamins were invented by a Dermatologist and Hair Physician with 27 years in Dermatology treating hair loss. We are the only Hair Protein Shake to be recommended by over a 110 Hair Clinics Worldwide. Free Shipping on a case of Shake and Free Shipping on all orders over $350. (USA only.) Email us for coupon towards international orders. We ship Worldwide! Easy to use and works fast! I was using a marine collagen and had to take 4 large horse pills capsules a day. I spent $80/month and it did not work. I switched to Help Hair shake and within 2 months my hair loss reversed and at 6 months I have a full head of hair! Plus it is easy to use and tastes great. I look forward every morning to using the shake. I like vanilla and use the chocolate when I want to use it as an evening snack. It is only 75 calories so better than a piece of chocolate cake. I just bought the multi pack so I decided to try the other flavors too and it came with free shipping so it was great value. It grew back my hair and it tastes great! I found the shake on the internet. I looked at the doctors listed and could not believe all the doctors that recommend it. I bought a 5 month supply of the shakes and vitamins and it grew back my hair. The crazy part is it tastes great! Help hair Shake works great and the Helphair shaker makes it easy to mix. Help hair Shake works great and the Helphair shaker makes it easy to mix. I mix the shake with 12 oz of almond drink. Tastes great and I do not have to make a mess with a blender. Just shake up the shaker and leave it in the refrigerator overnight and take it to work for breakfast in the morning. My hair was coming out in clumps. Now it is full and strong. I stopped using work out products like my doctor told me to avoid. Finally a solution for my hair loss. Finally a real solution for my hair loss. The shake and vitamins along with the shampoo and conditioner made my hair thicker and fuller within 2-3 months. So full that when I went to my hair dresser she wanted to know my secret. The shakes and vitamins are truly remarkable! The shakes and vitamins are truly remarkable! I tried all kinds of hair remedies but this product actually works! Stopped the work out products and Help hair saved my hair! Dr Sara Wasserbauer recommended the Help Hair shake and help hair vitamins and it saved my hair. She said I was losing my hair from my work out products and to stop using them and replace it with the help hair shake and vitamins. Thank you Dr Sara for the recommendation. It reversed my hair loss within 2 months and at 5 months my hair is looking great! I am a patient of Dr Scott Boden and it works great! I am a patient of Dr Scott Boden and it works great! Dr Boden recommended the shakes and vitamins. I bought it from him for several months and now I buy a case online along with the vitamins. He said it would stop my hair loss and reverse the thinning. It did exactly as he told me and now my hair is the way it looked when I was in my twenties. I like 3 advanced flavors- mocha, super greens , and berry. I recommended it to my girlfriend who lives in Vermont and she orders directly from the website. She is getting great results too! My hair loss physician recommended it. Works great! I have been using the shakes for 5months. My hair loss physician recommended it. Works great! My hair line was receding and now it has grown back in. I buy the mocha and berry in the 5 pack. I use the Shake and Vitamins daily with great results. Now I added the Rescue MD shampoo and conditioner and my hair feels Awesome! I love the flavors and would drink the shake even if I did not have hair loss! I love the flavors and would drink the shake even if I did not have hair loss! I have been using the shake and vitamins daily for over 3 years. I look forward to it as my morning breakfast. Only 75 calories. My hair is amazing and my hair loss has stopped and reversed completely. I buy all 5 flavors of the shake and mix them and I use the vitamins daily too! I typically buy a case. I like to buy all 5 flavors and mix them. I have been using the shakes for over 6 years now. My doctor in Georgia recommends them. I also use the hair vitamins along with the shake. I am 63 y/o now and my hair is looking better than when I was in my 40's I have 3 children and my mother had thin hair and after my third pregnancy my hair was so thin. I started the shake I had seen Dr Ed Griffin and he and his staff are so nice. They offered me the shakes but carried 3 of the 5 flavors. So I was very ambitious and tried them all. I like them and enjoy the variety and I also use the Leafy Green Shampoo and conditioner for even thicker looking hair. I may try the Nuts4Hair since when I visited Dr Griffins office recently they said it worked great along the shake and vitamins. I am a Patient of Dr Sean Behnam and he recommended me to these wonderful products! I use the 4 Step Program. Shakes Vitamins Shampoo and Conditioner daily for about 6 months now. He even explains it in a video how well it works and it grew my hair in after I suffered hair loss from constant stress. Dr Behnam is great and so is Help Hair! I am 72 years old and it works! I never write reviews and I am 72 years old and it works! I thought I would have to wear a wig forever when I went out of the house. Now I can go out and I get compliments from my grandchildren when I see them. I like the mocha best in the 5 pack. The best hair product on the market for hair loss. I had hair loss since I was 18 years old. It was slowly thinning over the last 10 years. I started the shakes when my wife went to Dr Ashely Curtis in Atlanta it was working for her so I started using it. My hair grew back nice and full and she buys it from her doctor but I buy online since they do not carry the Super Greens My wife likes vanilla. Her hair looks great and my hair looks like I am 18 again! Help Hair shake is a miracle! I was losing my hair from a bad divorce. My ex-wife took everything. And with the stress of alimony and child support I was completely thinning. I wanted to get back into the dating seen but with little or no hair I did not stand a chance. I looked online. I saw some products are close to $88/month and they have no proof except look like slick marketing. My friend had a Hair Transplant by some doctor in Connecticut. He recommended the help hair products and I was told they would help regrew my hair. I followed the suggested daily shake and hair vitamin and I get coupons so shipping is little or nothing. After 3 months my hair regrew like a sheep. I am at 6 months and I started to date again and my confidence is restored. I like the fact that I can order the case for free shipping. I just did that on my last order. I even ordered the 3 pack of vitmans again with free shipping. On my limited budget the product is affordable but has great results! Their customer service is great too. They do not have a monthly recurring charge so I know my CC wont get maxed out. I once ordered a vitamin for my prostrate and I could stop the recurring charge. I can tell this company is good because they do not want you to sign up unless you want to reorder yourself! I lost my hair from whey protein isolate. I grew it back with help hair shake. Took 6 months. Stuff is a "miracle". Shakes taste great and hair grew like a weed! I tried several hair vitamins. Did not work at all. I even tried biotin and took 10 mg a day. My hair still fell out. Then I went to my dermatologist, Dr Kois and she said to use the shake and hair vitamins. I am not at 6 months and my hair grew back completely. I now order the case (5 shakes) and even tried all 5 flavors and I bought the 3 pack of vitamins and both had free shipping and in North Carolina there was no sales tax. So I am paying around $2/day. I think it is well worth it for my luscious locks. I did not use any other messy products like minoxidil and Dr Kois did not recommend any lasers and that saved me a fortune. Help Hair 4 step program grew back my hair. Help hair 4 step program grew back my hair. I had surgery on my back. Lots of pain and rehab. My hair started falling out 6 months later. Help hair shake and vitamins reversed it within 4 months. I am using the the Leafy green shampoo and conditioner to volumize it and I also use the Rescue MD shampoo and conditioner which helps with the growth. I do not use them both at the same time. I even use the serum which regrew a bald spot on the back of my head. I am a medical doctor and I use it for personal use! I am a medical doctor and I use it for personal use! I had a hair transplant and used the shake for faster regrowth. My hair grew back within 5 months. Now I use it for the existing non transplanted hair and it maintains the hair and keeps it full and thick looking. Plus my transplanted hair looks amazing. I also use the help hair vitamins along with the shake and the volumizing shampoo and conditioner. I just tried the Rescue MD shampoo and Rescue MD conditioner. My new routine is I use the Leafy green volumizing shampoo an conditioner one day and I alternate with the rescue MD shampoo and conditioner on the next time I wash my hair. My hair has never felt so good. I am not in a medical field involving hair or cosmetics. I would have no reason to believe that products could work so well but they are actually amazing since I have had first hand experience with the great results. If for some reason a hair loss issue comes up in my office I always mention the products to my patients. Click the button below to add the Help Hair® Shake (30 servings 2.1 lbs.) Doctor Formulated and Recommended by Worldwide Hair Clinics! to your wish list.